Dubai, United Arab Emirates – April 30, 2018 – SUSE, a pioneer in enterprise open source software, today announced that it has signed a distribution agreement with StarLink, for the Middle East & North Africa (MENA) region. 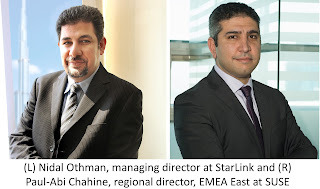 The partnership will allow SUSE to continue expanding their footprint in the region by leveraging StarLink’s capabilities, channel community and customer base. For StarLink, SUSE Software Defined Infrastructure (SDI) solutions complement and strengthen their Cloud & Data Center (DC) offerings, especially in the storage stack, and as such, complete their Software Defined Data Center (SDDC) portfolio, providing customers with the ability to continuously innovate and adopt new technologies, faster. “As we prepare for the ‘cloud-ready future’, over the last few years we have been investing in expanding our capabilities and solution portfolio in the areas of SDDC, cloud storage and backup. As a leading provider of enterprise open source solutions, SUSE’s innovative SDI portfolio perfectly complements the SDDC solutions in our division and we look forward to this partnership as we strongly believe that this association will add tremendous value to each of our organizations,” said Nidal Othman, managing director at StarLink. As part of the partnership, StarLink will offer SUSE’s complete solution portfolio but based on customer demand and market needs, StarLink will focus primarily on SUSE Enterprise Storage and SUSE cloud solutions. SUSE Enterprise Storage, is an intelligent software-defined storage management solution, powered by Ceph technology, that enables organizations to deliver a unified, highly scalable, resilient and cost-efficient storage, that is able to seamlessly adapt to changing business and data demands. The solution has been designed to help enterprise DevOps and IT Operations teams reduce complexity and regain control of IT assets, ensure compliance with internal security policies and optimize operations to reduce costs. SUSE OpenStack Cloud is an enterprise-ready technology for building Infrastructure-as-a-Service (IaaS) private clouds, giving customers access to automated pools of IT resources to efficiently develop and run applications and workloads in the data centre. Providing customers with the flexibility to quickly and easily respond to new demands. SUSE OpenStack Cloud closely integrates with SUSE Enterprise Storage, powered by Ceph, for highly scalable and resilient software-defined storage capabilities. “According to recent research by Research and Markets, the SDDC market is expected to grow at a CAGR of 19.88% between 2017 and 2022. This is in line with the demand we are seeing for our solutions in the MENA region and to that end, we are aggressively looking to expand our market reach,” said Paul-Abi Chahine, regional director, EMEA East at SUSE. “With an on-the-ground presence in all key markets across the region and outstanding technical, sales & professional services & training capabilities. StarLink has all the requisite attributes we are looking for in a distribution partner,” concluded Sandiip Chhabra, SUSE Channel & Alliance Manager, MENA.